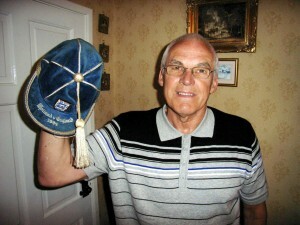 Wignall with his England cap from the draw in Holland in 1964. Frank Wignall has revealed how he might just have prevented Geoff Hurst from becoming one of English football’s biggest heroes of all time. The 69-year-old, an interested party this weekend as two of his former clubs meet at the City Ground, was in a strong challenging position as an England striker four and a half decades ago until injury took a hand. And he believes he may well have been in Alf Ramsey’s World Cup squad had he not been struck by the cruel misfortune of breaking his leg three times. “I played a couple of England matches, against Wales and Holland very late in 1964, and scored two goals in the first of them,” he said. “I was determined to push hard to establish myself but England weren’t playing again until the following April and I broke my leg at the end of that season. “I hardly played in the following season but drove myself on so much that I broke it again playing for Forest at home to Newcastle. Wignall, still living just outside Nottingham after serving Forest and Derby either side of a prolific but brief Molineux career made up of 36 appearances and 16 goals, remains a keen watcher of the professional game, albeit mainly on TV. 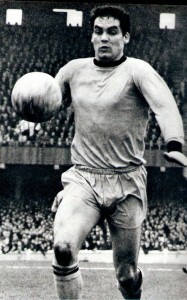 And he has a fond memory of the time he played for Ronnie Allen’s Wolves against Forest near the end of the 1967-68 top-flight campaign. “I recall driving towards Wolverhampton for the game and following a coach-load of Forest supporters,” he added. “They were making various gestures at me and suggesting, with use of their fingers, that they thought their side were going to win. “But we had one of those days when everything seemed to go right and I got myself a couple of goals in a 6-1 victory. On the prowl with Wolves in a game at Coventry in 1968. “Would you believe it – I came up behind the same supporters’ coach on the way home! * Note: The England teams in which Wignall played at home to Wales and against Holland in Amsterdam contained several names familiar to Wolves fans. Bobby Thomson, Mike Bailey, Ron Flowers and Alan Hinton all featured in the 2-1 win against Wales at Wembley while Thomson and Flowers lined up against the Dutch in a 1-1 draw. Posted on: Friday, March 20th, 2009.